Relocating to a new state as we have, you tend to have vivid memories of foods no longer available to you. One of my favorite cookies was sold at a local bakery in California and in the past I had emailed them to purchase said cookies but, they never did get back to me....I take it back, they did and even agreed and then when it came time to send payment? No response so of course, no cookies. The cookies this bakery made were sugar cookies with a thick layer of hardened icing. They were so good, extremely sweet and expensive. Let me add that these were so sweet that if you had any opened cavities? You were doomed for days in pain. I couldn't resist though! I couldn't wait to taste these cookies so instead of setting them aside for dessert after dinner, I opened the cookies and passed one to each of my children as well as myself. The cookie was slightly buttery with hardened icing and the "smile" made me smile as my mouth watered. To make a long story short, these cookies are delicious! I enjoyed and savored every bite. One thing that I love about the Smiley Cookies would have to be the fact that they are not overly sweet. I believe that I have found a new favorite cookie and with the cost of only $9.99 a dozen? I will definitely be ordering some in the near future. Did I mention that these heart shaped cookies were huge? They are worth every penny. I am not alone, just check out the rave reviews under the Smiley Cookies! How long will Smiley Cookies stay fresh? As long as they remain in a sealed container, your Smiley Cookies should remain fresh for about a week. They will lose freshness more quickly if left out. However, 20-30 seconds in the microwave will "refresh" a hardened cookie. Additionally, if you’d like to preserve your cookies longer, they can be wrapped and stored in the freezer. Smiley Cookies contain the following allergens: wheat, soy, egg, and milk. All of our items are guaranteed to put a smile on your face. 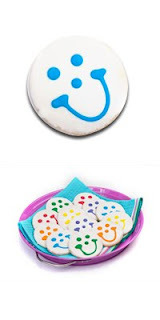 SmileyCookies.com offers cookie designs for any occasion as well as a chance for you to create your own design? How cool is that?! Did you know that the company who creates these delicious cookies "Eat'n Park" happens to be a restaurant chain? You can find the nearest location to your home HERE. Unfortunately, I haven't had the pleasure of experiencing the menu yet although I am willing to bet that they are great. Now the fun part! Continue reading for your chance to try these great cookies. You can purchase a dozen (or more!) cookies for $9.99 each from SmileyCookies.com. Don't forget to check out the other gift items they offer! Just share in a comment below, what is a food that you miss? AND Your favorite cookie design listed on the website. That's it, very simple and you may enter daily! BONUS ENTRIES: Please leave a separate comment for each entry you complete. Each of the following are worth (1) extra entry. *Follow me on twitter @mrsmiki77 & tweet about this giveaway. Come back and post your "tweet" link and username. I will follow you back! Winner will be chosen and contacted by email. You must reply within 48 hours with your shipping address or another winner will be chosen. Once shipping information has been received, I will then contact the sponsor with your information so that they can mail out your prize. Disclaimer: I have not and will not be paid for this review. I had received a dozen cookies as a prize from another blog owner's giveaway and I have only posted my own personal opinion to share with other readers. I contacted SmileyCookies.com who offered to sponsor this giveaway. I hold no responsibility between you and the company, and/or products you may purchase or receive from them. food I miss pierogis that granny made, or gyros. I miss my mom's french toast and I love the baby girl smiley cookies! Oh man Michele. I MISS Smiley Cookies. We don't have Eat N Park down here. My favorite shape is the Shamrock Cookie. I had a friend that worked at Eat N Park in Pa and I'm Irish and on St. Patty's day one year he snuck one for me and decorated Kiss Me I'm Irish on it and brought it home to me. Man good times good times. I miss them so much, that was a dang good cookie. I'm a long time blog follower, I love your blog! I miss Spanish paella marinera...haven't had it in almost 7 years. I like the original smile cookie. I miss my friend's parent's used to own a Chinese restaurant and served the most AWESOME Chicken Hot Pepper! I miss that! I like the Heart Smiley Cookies. I miss my mom's homemade tomato sauce. I like the Heart Smiley Cookies. They used to have a candy bar called a Marathon bar that was chocolate and caramel twisted and it was very long. They don't make it anymore in the US. I miss my grandmothers homemade sour dough bread. The best bread ever! My fav cookie design is the Milk Chocolate Smiley. I miss some chips from when I was little that looked and tasted like bacon. They were wonderful. Also Hubba Bubba bubble gum flavored soda! I miss my grandma's pound cake, no one made it like she did! I love the pink or blue baby cookies. They would be a great welcome to world baby gift! The food I miss the most is my Grandma's duck soup. My favorite cookies are the Smiley Fish cookies. I like the Shamrock Smiley cookies and I miss my grandmother stuffed peppers. I like the Shamrock. Thanks for the chance. The Fish Design is my favorite design listed on the website. What I miss is the original Hershey Kisses. I miss that original chocolate taste! *sigh* I miss steak... how's that cooked again? I miss eating Nerds cereal. My cookie choice would be the pirate smiley. I miss my mom's apple tapioca pudding--can't find the recipe anywhere! Well in Erie Pa. they had a period where they did animal shapes. Monkeys, Rhino's that we thought were dinosaurs. I miss my momma's chili. She made the best darn Chili! I miss my dad's homemade marshmallow nut log candy. I picked the Shamrock one. Im following your blog as checkers. Following you on Twitter (id- checkkers) & Tweeted. My Mom use to bake these cinnamon cookies when I was young, sure miss them. The baby girl smiley cookies are really cute. daily entry, I miss cotton candy, haven't been to a fair in years. I miss the premium icecream shop i used to work at...But i'm LOVING the dinosaur cookie design! Following blog via google friend connect! I'm not sure if this qualifies as a food, but I miss hubba bubba blueberry gum, gosh I loved that stuff when I was a kid! I miss my grandma's homemade chicken noodle soup, even her noodles were handmade. The Shamrock Smiley Cookies are cute for March! I miss my Grandma's stuffing at Thanksgiving (and her presence even more). I miss the food from the Chinese restaurant that went out of business in my hometown. Their hot and sour soup and fried rice were amazing. I like the original cookie faces. The white with the cute colored faces are adorable. White with Orange face is my favorite. i miss coldstone ice cream, the one in my town closed! I miss ice cream. I like the original smile cookie. I miss my grandmother's cooking - her cucumber salad was to die for (and I can't duplicate it, no matter how I try), her milk rice, everything! My favorite smiley cookie today is the Bunny cookie! I miss Perry's Ice Cream. We used to buy it in PA. They don't have it here. Thanks for the yummy giveaway. I miss my one grandma's spaghetti she used to always make. No one elses could compare. I miss my Mom's chili. I like the pirate smiley cookies best. I really miss my grandmother's homemade noodles - no one in the family been able to even come close to how hers tasted (30 members have tried and failed). I like the pirate smiley cookie. I miss my grandmother's homemade noodles - no one in the family been able to even come close to how hers tasted (30 members have tried and failed). I like the pirate smiley cookie. I miss my dad's Norwegian Cucumber Salad, his Danish Oat Cookies and his Sourdough Bread. I have the recipes but they don't taste as good as his. I'm missing an ingredient, I think - Daddy's Love. I miss my grandmother's homemade noodles. I like the pirate smiley cookie. I like the Bunny Smiley Cookies and I miss my Grandma's Chicken and Dumplings. Thanks! I like the Heart Smiley Cookies. A food I miss is the ORIGINAL Keebler Wheatables crackers (like from the early 90s). They changed the recipe in the late 90s, but they are totally different now. The original recipe was soooo much better (with like an onion flavor). There was a local pizza place who served a spicy pizza that I loved. I like the Steeler's smiley cookies. When we moved we left behind our favorite burrito joint. Have never found one as good. I really like the goldfish-shaped cookie. I like the Bunny Cookies, and I miss cotton candy. I loved it as a kid and haven't had it in years. 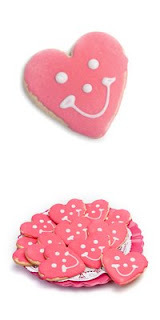 I like the pink heart smiley cookies. Imiss pizza when I can't have it. I really miss my grandmother's homemade noodles. I like the pirate smiley cookie. I like the bunny cookies and I miss my Mom's Pecan Pie. I like the Bunny Smiley cookies. I miss my mom's rice pudding. I have never ate a Smiley's Cookie and I miss my mom's Potato Salad ! I miss all of my mom's cooking, especially her soups. I like the heart smiley faces. Daily entry--miss my mom's apple tapioca pudding, and don't really have a favorite among the cookies. A food that I miss is my grandma's roast on Sunday afternoons. My favorite smiley cookie is the pirate! I miss my Mother's Thanksgiving dressing/stuffing; Milk Chocolate Smiley Cookies for me! I miss the Mars candy bar! I love the Bunny Smiley Cookies! I miss my grandma bacon and the design I like Bunny Smiley Cookies . I miss good humor fat frog ice cream bars. I love the Shamrock smiley cookies. As far as the round deisgn your own ~I love the purple! The food I miss the most is NUTS......I have dentures now & cannot eat nuts...boo hoo! I dream of a big bag of salted & roasted nuts/cashews & trashmix straight from the old woodburning stove my grandparents had at their camp. Follow on Twitter & Tweeted! I like the Bunny Smileys. I miss my ex's French Toast.